Leukoplakia of the mouth cavity. How to treat leukoplakia of the mouth cavity? Leukoplakia of the mouth cavity is a chronic disease. It is an inflammation of the oral mucosa of the mouth cavity. Leukoplakia of the mouth cavity is often followed by epithelium hyperkeratosis. Damaged areas become thicker. Later they are covered with corneal layer followed by epithalaxia. 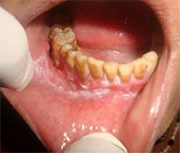 Leukoplakia of the mouth cavity usually affects the inner mucous part of cheeks, corners of the mouth, and the tongue. It is important to know that men over 40 are more prone to leukoplakia of the mouth cavity. The disease can be caused by a number of factors. Traumas of the mouth cavity, influence of spicy or hot food, wounds caused by hooks of prosthetic appliances, smoking, and addiction to alcoholic beverages are equally dangerous for the mouth cavity. The most important thing you should know about this disease is that it has practically no symptoms. Sometimes leukoplakia of the mouth cavity can cause itch or light burning. Eventually, only your dentist can say for sure whether you have leukoplakia of the mouth cavity or not. The thing your dentist can find in your mouth cavity in case you suffer leukoplakia of the mouth cavity is a whitish element of tissue. By touch it is thicker than the surrounding tissue. In case you suspect leukoplakia of the mouth cavity hurry up to see your dentist. You will definitely undergo histological analysis of scrapes of the inflamed part of the oral mucosa. Do not be scared by such a great number of necessary tests. The thing is that there is a great risk that inflamed tissues will regenerate and become a malignant mass. So, as you see, it is better to see the dentist as soon as you see the first symptoms of the disease. Moreover, do not forget that it is recommended to see your dentist at least once a year because if you do not there is a risk that dental diseases will develop unnoticed and finally cause many problems. Treatment of leukoplakia of the mouth cavity presupposes oral cavity sanation as well as elimination of all annoyances that can cause the disease. It is necessary to adjust the prosthesis (if you have one), smooth the acute edges of teeth, to give up smoking and drinking alcoholic beverages. Try to make your food less spicy. Do not eat it hot. Moreover, your dentist will prescribe you vitamins C, B6. Moreover, you are recommended to undergo 2 courses of therapy. As you see, treatment of leukoplakia of the mouth cavity is neither painful nor unpleasant. The main thing is to give up your bad habits and take vitamins.